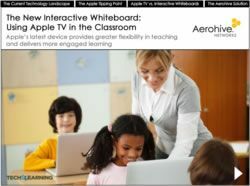 Early adopters of Apple TV in the classroom believe that it is a cost-effective alternative to the interactive whiteboard; offering benefits that the whiteboard does not. Using Apple TV with any Apple device allows teachers the greatest flexibility with their instruction and management of the class. Teachers can move around the room working with individual students or small groups while keeping the entire class focused on the lesson.